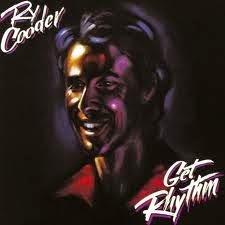 1987's Get Rhythm was Ry Cooder's first new studio album in five years, as he had spent most of the 1980s working on film soundtracks (a selection of which can be heard here). It featured his usual mix of American roots music forms, but was notable for focusing mostly on an electric blues-rock sound. The band backing him throughout featured some familiar names whom had already worked with him over the years - pianist Van Dyke Parks, accordion player Flaco Jiménez and drummer Jim Keltner. Backing vocals were provided by Bobby King, Terry Evans, Arnold McCuller and Willie Greene, Jr. Songs covered on the album included the title track by Johnny Cash, Chuck Berry's "Thirteen Question Method" and Elvis Presley's "All Shook Up". One standout song was "Across The Borderline", a beautiful original written by Cooder with John Hiatt and Jim Dickinson. This song had already been featured before on Cooder's soundtrack to the 1982 film The Border, there sung by Freddy Fender - on the new version, Cooder shared lead vocals with actor Harry Dean Stanton (who had also starred in another film Cooder had done the soundtrack for - 1984's Paris, Texas). It turned out to be his last solo album for a long time, as through the next decade Cooder focused on collaborations with other artists and more film soundtracks. FYI the download link is circular, taking you back to the short write-up. Thanks for fixing the link Charlie. Ditto the thanks and best wishes -- Stuck in the Past is the best! Just to wish you Merry Xmas and please bring us new discoveries in 2015. Thank you for this post and the Dr. John above. The photo booth rental miami photo booth and the new range of event services are very helpful as it manages the complete photo booth rental west palm beach work. As far that pieces are mainly dissuaded here and the author was learning about the benefit and function all related to photo booth rental booth. How can a booth help guest to get entrained and feel free to make more passing djs in miami time.